Soybean oil is a vegetable oil extracted from the seeds of the soybean (Glycine max). It is one of the most widely consumed cooking oils. As a drying oil, processed soybean oil is also used as a base for printing inks (soy ink) and oil paints. 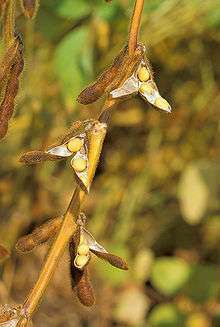 To produce soybean oil, the soybeans are cracked, adjusted for moisture content, heated to between 60 and 88 °C (140–190 °F), rolled into flakes, and solvent-extracted with hexanes. The oil is then refined, blended for different applications, and sometimes hydrogenated. Soybean oils, both liquid and partially hydrogenated are sold as "vegetable oil," or are ingredients in a wide variety of processed foods. Most of the remaining residue (soybean meal) is used as animal feed. In the 2002–2003 growing season, 30.6 million tons of soybean oil were produced worldwide, constituting about half of worldwide edible vegetable oil production, and thirty percent of all fats and oils produced, including animal fats and oils derived from tropical plants. Per 100 g, soybean oil has 16 g of saturated fat, 23 g of monounsaturated fat, and 58 g of polyunsaturated fat. The major unsaturated fatty acids in soybean oil triglycerides are the polyunsaturates alpha-linolenic acid (C-18:3), 7-10%, and linoleic acid (C-18:2), 51%; and the monounsaturate oleic acid (C-18:1), 23%. It also contains the saturated fatty acids stearic acid (C-18:0), 4%, and palmitic acid (C-16:0), 10%. The high-proportion of oxidation-prone linolenic acid is undesirable for some uses, such as cooking oils. Three companies, Monsanto Company, DuPont/Bunge, and Asoyia in 2004 introduced low linolenic Roundup Ready soybeans. Hydrogenation may be used to reduce the unsaturation in linolenic acid. The resulting oil is called hydrogenated soybean oil. If the hydrogenation is only partially complete, the oil may contain small amounts of trans fat. The carcinogen N‐Nitrosodi-n-butylamine has been measured in soybean oil at a concentration of 290 μg/kg, in cheese at 20 to 30 μg/kg, and in smoked or cured meats at up to 3.9 μg/kg. It has also been detected in tobacco smoke at a concentration of 3 ng per cigarette. Values as percent (%) by weight of total fat. Soybean oil is mostly used for frying and baking. It is also used as a condiment for salads. Soybean oil is one of many drying oils, which means that it will slowly harden (due to free-radical based polymerization) upon exposure to air, forming a flexible, transparent, and waterproof solid. Because of this property, it is used in some printing ink and oil paint formulations. However, other oils (such as linseed oil) may be superior for some drying oil applications. While soybean oil has no direct insect repellent activity, it is used as a fixative to extend the short duration of action of essential oils such as geranium oil in several commercial products. Soybean oil is traded at the Chicago Board of Trade in contracts of 60,000 pounds at a time. Prices are listed in cents and hundredths of a cent per pound. ↑ United States Department of Agriculture, Agricultural Statistics 2004. Table 3-51. ↑ Poth, U. (2001). "Drying Oils and Related Products". Ullmann's Encyclopedia of Industrial Chemistry. doi:10.1002/14356007.a09_055. ISBN 3527306730. ↑ Ivanov, Dušica S.; Lević, Jovanka D.; Sredanović, Slavica A. (2010). "Fatty acid composition of various soybean products". Journal of the Institute for Food Technology in Novi Sad. 37 (2): 65–70. Retrieved 21 June 2013. 1 2 3 4 5 6 7 8 "Nutrient database, Release 24". United States Department of Agriculture. All values in this column are from the USDA Nutrient database unless otherwise cited. 1 2 3 4 5 6 Katragadda, H. R.; Fullana, A. S.; Sidhu, S.; Carbonell-Barrachina, Á. A. (2010). "Emissions of volatile aldehydes from heated cooking oils". Food Chemistry. 120: 59. doi:10.1016/j.foodchem.2009.09.070. 1 2 3 4 5 6 Wolke, Robert L. (May 16, 2007). "Where There's Smoke, There's a Fryer". The Washington Post. Retrieved March 5, 2011. ↑ Barnard DR, Xue RD (Jul 2004). "Laboratory evaluation of mosquito repellents against Aedes albopictus, Culex nigripalpus, and Ochierotatus triseriatus (Diptera: Culicidae)". Journal of Medical Entomology. 41 (4): 726–30. doi:10.1603/0022-2585-41.4.726. PMID 15311467. ↑ Fradin MS, Day JF (Jul 2002). "Comparative efficacy of insect repellents against mosquito bites". N Engl J Med. 347 (1): 13–8. doi:10.1056/NEJMoa011699. PMID 12097535.